The Elliot Hospital Associates has groups of women and men who get involved in activates that they enjoy and that enhance the mission of the Associates. For example, the Voluntaires is a singing group of 40+ singers who enrich the lives of many through music. The Sewing Ladies sew special lovingly-made products that enhance the patient experiences of all ages. Other members volunteer their services during a specific event or fund-raiser. This page highlights individual projects and activities as examples of the ways that the Associates contribute to patient care at the Elliot Hospital. Do you love to sing? Would you like to join us? The Voluntaires are a singing group of the Elliot Hospital Associates. 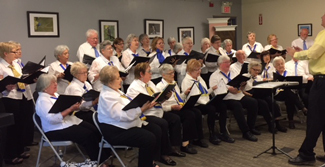 We are 40 singers whose voices in chorus spread cheer as an outreach of the Elliot Hospital. Rob Dionne is the chorus director and Ruta Daugela is the accompanist. The main purpose of this singing group is to bring cheer, joy and happiness through music. Our singing group goes to nursing homes and assisted living communities in the greater Manchester area. We also perform at a couple of community events throughout the year. To join the Voluntaires, become a member of the Elliot Hospital Associates. Go to the link on the Membership section of the Associates, and indicate on the form that you are interested in singing. The Sewing Ladies of the Elliot Hospital Associates make contributions to the patient experience in ways both large and small. Large like the clothing protectors made for the patients of the Geropsychiatric Unit (GPU) and small like the tiny eye protectors worn by the babies in the Neonatal Intensive Care Unit (NICU). Led by Diane Valade and Gail Cherochak, these 12 women come to the Elliot Hospital Volunteer Department, where sewing machines are ready for their daily use. The Sewing Ladies create all sorts of items valuable to the care of sick babies. Did you know that when a baby has jaundice and needs to be treated with bright lights, the baby needs to wear eye patches to protect their eyes? The Sewing Ladies make these eye patches. They also make tiny pillows (sometimes called “frogs”!) for baby positioning and comfort. And they are making a new little bag to hang on the side of each baby’s bassinette, incubator or warmer. All items are made with soft fabrics in colorful baby patterns. “Families smile when they see them, and know that their babies are cared for in kind and special ways,” says Andria Dobberstein, the Nursing Director of Women’s and Children’s Services. With the donation of many colors and printed fabrics, women's lace and men's ties, the Sewing Ladies create clothing protectors for the fashion fancy of each patient on the GPU. Why have this clothing be drab and utilitarian? Why not be fashionable, fanciful, and fun? The Sewing Ladies design and create each item with loving care, proud of their creativity and contribution to care in the GPU. Andria Dobberstein, the Director of Behavioral Health Services at the Elliot expresses the extent of the contribution this way, “These clothing protectors integrate ties, lace and fabrics into unique designs. They are important in helping patients keep their own clothing clean, while adding a sense of style, dignity and purpose for each man and woman. This care and kindness means a great deal to each patient and her or his family.” A new project this Fall: Bags to hang on the side of walkers of the patients of the GPU. Each bag is unique in fabric and selected to reflect each patient’s unique styles. All of these projects truly reflect the Associate’s mission: “ To support a warm and caring atmosphere within the hospital for patients and families.” The Elliot Associates Sewing Ladies always appreciates your donations of fabric, thread, lace, men's ties (both straight and bow ties!) and other sewing supplies. If you have fabric or supplies to donate, please bring them to the Volunteer office or call 663-2298, to arrange a time for drop- off. You will be amazed to see what this group of talented women creates with your donations! If you are interested in becoming a member of the Sewing Ladies of the Elliot Associates, please complete an application on-line. The application to become as Associate is on this web page. We will be in touch with you!